Check out this video full of great nuggets regarding Pay Per Click. If you want sales and leads tomorrow, Pay per click can do that for you. If you don’t like pay per click..you might be crazy. Virtually EVERY business can make money from a pay per click campaign. You should contact DBM right now if you’re not using Pay Per Click. Seriously….you should contact them RIGHT NOW! In today’s topic, Dustin, Andrew and I discuss the topic of Scenario-Based Nurture Marketing. Scenario-Based Nurture Marketing involved nurture a prospect according to how they initially interfaced with your organization. For example, if you met someone at a networking event, then you, or someone within your organization, would take their card and enter their information into a list which contains a series of emails for people you meet at networking events. It may begin like this, “ (their name ), it was a pleasure meeting you at last night’s event. I appreciate your offering up some of your time to speak to me. I’d love to get to know more about you and your business…” See what I mean. Make sure the email talks more about THEM; therefore, resist the urge to dive-bag your products and services. The time will come when they will ask you more about yours. Of course, the above example is just one scenario in which you may meet with a potential prospect. For that reason, you may want to sit with a marketing consultant like that ones we have to in order to outline all of the possible scenarios in which you meet client-types. NEW IN THE INDUSTRY: Seller Leads widget on every page of your website! Wow! Keeping your competitive edge for seller lead generation has never been easier for new agents and tenured professionals. We’re introducing an extremely affordable version of our hot selling product, the Home Profit Calculator or HPC – it’s called the HPC Widget. No set-up costs, just one low monthly fee. Now you can have your very own HPC, as a widget, for any and every page of your website; yes the embed version is still available as well, so you can embed the HPC into any of your websites as well. Sweet huh? Easy to use backend to manage leads, reports, colors, etc. Take a look at in action here – Wells Realty Law (take a look at the orange widget at the bottom left). The widget can also be customized with your colors and in a different location. Click the following link to ‘HPC Widget Order Form’ (Right click and then click ‘Save as…”). When you order, if desired, we will connect to your CRM at no charge until July 31st. Send the order form back to me at [email protected]. When it comes to Real Estate Marketing, we’ve know that it’s all about generating quality leads. For that fact, we’ve instituted a full lead generating marketing solution. Check out the video below to see a demo. Today we’re going to talk about three things your technological systems must have. When you’re marketing and thinking about setting up your technology systems, you want to take into consideration how much you spend on marketing and how much you spend on your technological systems. If you have a budget of $5000 to put together a marketing campaign, you want to take the opportunity to talk to someone that understands what the balance should be between how much you spend on your lead generating items and how much you should spend on technology. Most likely your technology is going to have a monthly recurring cost that should include some of the things you need. First, you should have a web content management system; not just a website, but also a web content management system (WCMS). The difference is that a WCMS has a blog option to it, which you should be using. Now you’re managing your content and satisfying the human need as well as the search engine need. The more content a person sees on the internet about you, the more they’re going to trust you; your credibility also increases and the easier they become a client. So, how much of your budget should be spent on technology and how much should be spent on other lead generating resources. It shouldn’t be half and half, but closer to 70/30 or 80/20. Second, you should have a customer relationship management system (CRM). This should be integrated with your website so when the lead comes in, it gets stored within your system. This is very important and absolutely needs to be stored within your system; this should also be part of your technological budget. Third, you want to make sure there’s the opportunity to have auto responders as well as task notifications. If you have an action plan, it may include giving the lead a call and you want to ensure it is documented and completed. You want to ensure that some of these tasks can be completed automatically to give you to opportunity to do what you need to do, like talking to clients, selling and nurturing clients. There’s also an optional process management; you need to understand how your business has processes and how you do things. We have a big process mindset within our organization because we want to move from point A to point B in the most smooth and efficient way. We can get this completed with some sort of process. If everyone understands the processes within your organization, there aren’t any questions about what needs to be done and everyone knows what needs to be done. Hello everyone Granison Shines here Chief Marketing Officer with Direct Business Marketing thank you for your time today. If you are looking for great tips to improve your small business marketing strategy make sure to check my blog frequently as I update you with the tools to success. If you have questions about your specific marketing strategy feel free to contact me through our website or call me directly to discuss how Direct Business Marketing can help you. In my blog today I wanted to issue a little reminder to small business owners who are utilizing the nurture e-mail campaign. While e-mail marketing is a critical part of a successful marketing strategy we don’t want to bombard clients, or potential clients, with constant business related e-mails. For this reason it is always a good idea to spinkle in the occasional non-business e-mail to keep things fresh. Whether it is a funny picture of cats or a great recipe for cookies the last thing we want to do is get your potential clients burned out on daily e-mails full of strictly business related offers. By mixing in a few fun e-mails now and then it will give your potential client a reason to look forward to your e-mail instead of just assuming it is more of the same. These fun e-mails could even be a great way to interact with a potential client and help you learn about their interests or hobbies. In using these fun e-mails and also video blogs you are also allowing your clients to get to know you as a person and not just someone who sends out e-mails. Gaining this comfort level and avoiding the perception of someone who is only focused on business may help you open up communication with your clients. So don’t forget to mix things up when utilizing your nurture e-mail campaign in order to put a smile on your clients face and attract their attention. For more information make sure to download our free marketing assessment tool on the Direct Business Marketing website. I’m Granison Shines, thank you again for your time and have a great day. Today we’re going to continue our discussion on event marketing. The document you’re currently looking at is an event marketing action plan; I’ll tell you how you can get this helpful document later on in our discussion. The main topic we’re going to go over today is event details; I can’t stress enough how important the event details are. Why do we want the event details? It allows us to fill out the event summary later on; the event summary will have all of the components that you see right now. The first field on the page is for your event link. One of the things that we like to do is use EventBrite. It’s not something that you have to use, but we do use it internally at Direct Business Marketing because it saves us time with setting up a customized landing page. It works very well for us. This can be any type of link because this link is going to be on all of the marketing materials that you distribute. Next is the event type where you’ll want to identify whether it’s a seminar, webinar, meeting, workshop, etc. Then there’s the event title which is important because you always want to have the headline be the event title. The client-type or target market; internally we use the term client-type because that defines who we’re going after. Having this client-type identified is crucial because you can list on your marketing materials who should attend your event. Next we have the event date, venue, address and cost. If there is a cost for your event, I always suggest doing an early bird discount because it always makes a strong point. The targeted number of attendees and potential revenue are also listed at the bottom of this document. Another thing that’s important is the offer; you always want to have some kind of offer. A soft offer, which we always like to use at the front end of the campaign to incentivize them to sign up for it, should be immediately available upon registration. All you need to do is fill out the soft and hard offer fields. What are you offering at the front end of your campaign? Any time you have an offer, you also want to sure that you include a total value. Then there’s the hard offer, which you’re actually going to try and upsell them at your event. What is your hard offer and what is your event’s special offer? You need to communicate to them that you’re going to offer them a special price on your product simply because they attended your event. Next time we’ll talk about some of the sponsor-related things you should have for your event. If you have any additional questions please feel free to contact me via phone or email. I’d also like to encourage you to download our free Marketing Assessment document from https://directbusinessmarketing.com/ma. Hello everyone Andrew Houglum here with Direct Business Marketing talking with you today about understanding where you should be marketing. Growing your business includes numerous obstacles and it can sometimes be hard to determine the best locations to market your product or service. Today in my blog I am going to show you how our free marketing assessment tool can help you find the answer to this question. It is important to remember that all businesses have different clients that they are targeting and figuring out how and where to reach them is one of the most important steps. A business also needs to have a goal in place for what they want to achieve through their marketing. Certainly the goal is to increase sales but your marketing goal generally will not be that cut and dry. You may have a retail store front or simply operate online and this needs to be considered when planning your marketing goals. Our marketing assessment tool will also help you look at your current marketing and determine if it meets your expectations. This involves simple questions like do I have a website? Is it effective? Or do I need to consider making changes so it drives more sales lead. Our assessment will also get you thinking about how your clients make their decisions and what that will mean for your business. For some industries this doesn’t make sense but for others creating relationships and creating content online will help grow your bottom line. This free marketing assessment tool has already helped numerous business owners better understand how to make their marketing dollars stretch a little farther. Simply stop by the direct business marketing website today to download it for free and find out how to capture your clients attention with an efficient marketing strategy. This is Andrew Houglum with Direct Business Marketing thank you for your time and I look forward to helping you soon with all of your marketing needs. Today we’re going to continue our conversation on the marketing campaign flow. This is the third video in the series where we’ve been talking about the four parts of the marketing campaign flow, Generate, Capture, Store and Nurture. The first video in this series was an overview of the flow, so if you haven’t checked it out yet, please do so. You want to have at least five lead generating items at the front of your marketing campaign; we provide a number of services for our clients to make sure we generate the leads send them to the capturing the source. Once the lead is captured, you want to ensure that you store it. We suggest you store it in a CRM, email or your system’s backend. Storing your lead’s information is very important as well as the tracking portion of your marketing campaign flow. Each different type of marketing medium that you use to generate leads should have its own database so that you can track exactly where your leads are coming from. This is very important so that we can calculate the ROI and know what part of your marketing campaign is working the best for you; this allows us to adjust your marketing campaign if we need to. If you’re using email to store your lead information, make sure that it’s appropriately stored in the right place and is integrated somewhere else to ensure that your data doesn’t get lost. On the next video of our Get Direct marketing webinar we’ll talk about the fourth part of the marketing campaign flow, Nurturing the Lead. I’d also like to encourage you to go to https://directbusinessmarketing.com/ma and download our marketing assessment. This valuable, free tool can help you determine what marketing avenues are best for your business so you can get the most out of your marketing dollars. Right now we’re going to talk about Direct Business Marketing’s four step process when you develop a marketing campaign. There’s a certain flow that you want to abide by, so we’re going to teach you our method. It’s very simple and I’m going to give a brief overview of the marketing campaign flow in this video and then there will be subsequent videos that focus on each step individually. First, let’s talk about Generate; you want to generate traffic to the marketing piece, your website for example, to make sure we have traffic for the actual marketing campaign. After generating the traffic, you want to Capture the information of the prospect; it’s not a lead until they provide you with their name and email address. From there, you want to Store their information. We suggest you use some type of CRM, email or use some type of database that allows you to store their information so you have access to it, allowing you to Nurture the relationship. You can nurture the relationship with that prospect through phone, email or a drip campaign, for example. To recap, this is the four step process for our marketing campaign flow, Generate, Capture, Store and Nurture. In future videos we’ll focus on each step individually and what you can do to make the most of each part of the marketing campaign flow chart. I’d also like to encourage you at this time to check out our free Marketing Assessment at https://directbusinessmarketing.com/ma to help you find out which types of marketing mediums are best for your business and client-type. It’s a simple questionnaire and planning document that can really help you maximize the ROI on your marketing campaign, so please check it out. 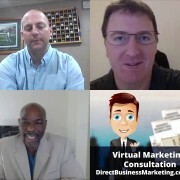 I look forward to seeing you again next week on Direct Business Marketing’s Get Direct live marketing webinar.